The floating villages of the Tonle Sap Lake are an enticing alternative attraction for visitors and each of them has its own unique characteristics. 99% of tourists who visit a floating village go to Chong Khneas at the northeast corner of the lake  its just a stones throw from Siem Reap and is a real floating village, moving its location depending on the water level - but it gets a lot of negative press because of the mafia who run its tour boats, its drinkshops with tame snakes, pelicans and monkeys, and its plethora of Korean tour groups. Further south from Siem Reap are two more floating villages that are fairly easily accessible, namely Kompong Phluk and Kompong Khleang. I visited Kompong Phluk in 2005, so this time I headed for Kompong Khleang. But dont think thats it as far as large settlements on the banks of the lake are concerned  Ive already paid a visit to Kompong Luong in the south and passed through Prek Toal in the north; and future visits to other villages like Moat Khla are on my must-see list. In all, there are 170 floating villages on the lake itself. Our visit to Kompong Khleang  51 kms from Siem Reap  began at 8am with the arrival of Rieng and Heng at my guesthouse in their Pajero 4WD. Id already been up for an hour, showered and enjoyed a chat over breakfast with new friends Juanita and Matthew. Taking Highway 6 through Roluos, it took us half an hour to reach Damdek. Heng told me it was 37 kms to our turn-off point to Kompong Khleang, opposite a small group of stalls a kilometre after the central market in Damdek. The road was sealed for another couple of kilometres then became less so as we took another twenty-five minutes of careful driving to reach the village. As it was the dry season, we were able to drive into the centre of the settlement, but at the height of the wet season, when the Tonle Sap expands to five times its normal size, its more likely youll need to enter by boat, as you do with Kompong Phluk. Rieng and I got out to walk along the high street as we entered the village  something of a misnomer as upwards of 30,000 people live there  as Heng drove to the market area to wait for us. Tourists are still something of a novelty in Kompong Khleang, so my presence elicited lots of hellos and waves from the adults and squeals of delight from the children. We stopped at regular intervals to chat to groups of women, of all ages, gutting the days catch of freshwater fish or setting out trays of tiny fish or shrimp to dry in the overhead sun. Behind the houses to my left  all of which were on high wooden poles or stilts up to ten metres off the ground  was the river channel that led to the lake but for now the street was dry and dusty, though would look considerably different in six months time. We reached the market area at the centre of the village which is on a small hillock, enabling the market itself, the health centre, the primary school and the pagoda to remain on dry land all year round. A wedding reception was in full flow  it was the wedding season in Cambodia afterall  as we walked around the market and called into the pagoda, which has colourful paintings on its outside walls and a weather-worn lintel, with Indra atop Airavata, by its front steps, the only relic from a long-disappeared Angkorean temple on the site. The school children were on exercise duty which consisted of running around the main school building ten times, so there were blue and white uniforms everywhere and a cloud of dust. Behind me I heard someone calling my name and turned around to find Rachel Wildblood  a VSO expert working with the fisheries office, who Id met last year in Kompong Thom  in the middle of a meeting with the communes fishing hierarchy. As you can imagine, fishing is the lifeblood of the whole community  I was told there are more than 200 species of fish found in the lake - so we agreed to meet later in the week, and I beat a hasty retreat to a drinks stall in the market, where Heng was in deep conversation about daily life in the village. The area that the settlement covers is enormous, its the largest community on the Tonle Sap and extends out onto the lake where there is a permanent group of floating houses. Next to the market is a pontoon bridge with a removable central section to allow boats to pass, that straddles the main river channel and leads onto a lot more houses and the secondary school. As we retraced our route back down the high street, we were invited to lunch by a group of women, who asked lots of questions and who made me blush with their compliments, and who also invited us to return in three days for a big ceremony in the village, which I had to decline. Our two-hour visit to Kompong Khleang had been an enjoyable one  I was the only tourist in sight  and it would be easy to spend at least the next few days getting to see more of village life but I had a full schedule, so we said our goodbyes to our new friends and headed back to Siem Reap. A couple of kilometres along the road back towards Highway 6, we stopped as a large crowd had gathered after a moto had struck a young girl, who was lying motionless at the roadside but our offer of help was waved away. I also spied a broken lintel in a spirit house next to a small bridge, where the taxi boats congregate in the wet season. I was back at the Shadow of Angkor guesthouse by 1pm for lunch with Kim in their excellent restaurant that looks out onto the Siem Reap river, just a block away from the bustling old market area. Kim is such a bright spark and an amusing lunch companion with her corny jokes, as we discussed her impending move to study at an Australian university. We also went for a browse around the aisles and stalls at the old market before I took a moto to the office of Sage Insights, close to the Hotel De La Paix. Sage is the brainchild of a pal of mine, Andy Booth and his Khmer partner, Phalla Chan and is a travel company with a purpose, whose profits go to supporting educational and social projects in the community and who have kicked off a volunteer program to support the children at Prey Chrouk school. I spoke to Andy using the online skype connection  he was at home in Italy  and also met Pip, their resident volunteer organiser, before returning to the Shadow with Phalla for a drink and a meal, where we were joined by Kim and later, by Pip. I agreed to visit their school in a couple of days time to see the difference their work is making to the lives of the children, and by coincidence, its also the home village of my guide Rieng. I was in bed by 11.30pm and went out like a light. Blog post: I spent an interesting few hours in the floating village of Kompong Khleang on my most recent visit to Cambodia in January. Its a massive, sprawling community, believed to be the biggest of its kind on the Tonle Sap Lake and we spent an enjoyable morning there, and were made particularly welcome by the people we met. Much like its neighbour, Kompong Phluk, the main thoroughfare, during the dry season, looks like something out of a spaghetti-western film-set, with its high-rise homes set on tall wooden stilts along a dusty street. 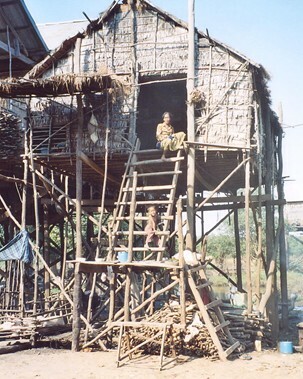 Above is a typical house on stilts though it will look completely different in the wet season, when the water level will rise substantially and the steps to the house will disappear under water. I certainly want to return at that time to experience the other side of Kompong Khleang. Blog post: This young girl was amongst a group of women of all ages who were gutting the day's catch of fish in the village of Kompong Khleang, during my visit there in January. In fact, under the stilts of every second or third house along the main street, were groups of women, happy in their work, and keen to engage me in banter and laughter. I was invited to lunch by two of the groups and even asked to return three days later for a big festival in the village. Everyone was ultra friendly. Kompong Khleang is the biggest of the floating villages on the Tonle Sap Lake, believed to house about 30,000 inhabitants but for my visit, we managed to drive our 4WD all the way to the village, whereas for much of the year, the houses are built on very large stilts for good reason. Aside from the upper half of the market, the main pagoda and the primary school, the rest of the village is under water for long periods. Like its neighboring floating village, Kompong Phluk, it makes for a very interesting and engaging half-day trip from Siem Reap. Its 51kms from door to door. Give it a go, you won't be disappointed.